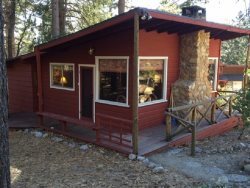 This newly remodeled home is close to the heart of Idyllwild yet private enough to make it the perfect place for an Idyllwild getaway and the fenced yard is perfect since this is a pet friendly home. Upon entering the home, there is a darling little covered/screened patio with cozy furniture where you can enjoy your morning coffee or just watch the little critters play all over the yard. Squirrels, chipmunks, and many varieties of birds. through the front French doors is an open floor plan with a dining room that seats 6 and a huge living room with giant fluffy couches, big screen tv and a wood burning rock fire place. These couches are amazingly comfy and just the place to snuggle up and watch a movie, cruise the internet, or read a book. A giant ottoman in front of the couches would be ideal for a family board game and lots of pop corn. The kitchen is also large with top of the line appliances, dishes, and everything you need to prepare a little snack or a gourmet meal. On the back patio, you can bar b q or just sit and relax while enjoying more of our beautiful Idyllwild scenery. Perfect yard for your kiddos or 4 legged babies to run and explore while still be under the watchful eye of mom and dad. Back inside and up just a few steps, you will find the first of 3 bedrooms with a queen size bed with memory foam topper. Super cozy!!! Just next door is a lovely bathroom with a massive soaking tup, rustic chic decor, and an elegant vintage chandelier top top things off. All that's missing is a glass of wine and a rubber ducky. :) Up stairs, there is another lovely bathroom, a bedroom with 2 twin beds, and the large master with yet another amazingly cozy king size bed. A lovely little sitting area in front of the large windows would be my choice for nestling down with a good book in the afternoon.